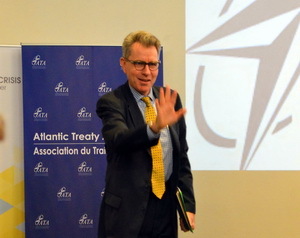 AMBASSADOR PYATT: Thank you, Vasyl. Thank you, Dmytro, for the excellent remarks. Let me first of all congratulate UCMC and the NATO folks for putting this event together. It’s extremely timely. The best evidence of that was the press conference yesterday given by the NATO Secretary General, where he placed a major focus on the challenge of hybrid warfare and the need for those of us in the Transatlantic community to think systematically about how we meet this challenge. It’s important to recognize that what we’ve come to call hybrid warfare, which Ukraine has now been subject to for two long years, is a combination of instruments. It’s economic pressure; it’s military pressure, the little green men; it’s political pressure; and of course, it is information pressure and the weaponization of information. The most important single principle to understand about this information warfare is that it’s not the objective of the Russian Federation in this effort to win an argument; the goal is not to prove the truth. The goal, rather, is to confuse, distract, deny, and to get Ukraine off track -- to keep us off balance. And the sooner you understand that that is the objective, the easier it is to think about what is the most effective response. I think all of us have learned a lot over the past two years about Russia’s tactics and objectives in this effort. I remember vividly, just about two years ago, just after the revolution, in the last days of February, an American journalist, Chris Miller, who was then reporting for the Kyiv Post, traveled down to Crimea, and he was one of the first international journalists to visit Crimea before the Russian invasion and annexation. And Chris reported, as he arrived in Crimea, how struck he was by the number of citizens there who were fearful of the fascists who had taken power in Kyiv, and were worried that some fascist battalions, that Praviy Sektor was about to send its tanks into Crimea to violate people. And of course, we all know – we thought it was funny at the time, but that demonstrated a pattern which has repeated itself, and this Goebbels-like propaganda machine that the Kremlin has deployed as part of its strategy against Ukraine. Now I think it’s important to recognize, and this goes to the conference that Vasyl alluded to, the pitfalls in dealing with this propaganda warfare. The biggest mistake that we could make, the biggest mistake that Ukraine could make, is to spend all of your time and all of your energy trying to counter those lies – to spend all of your breath saying: “There are no fascists! What are you talking about?” That’s exactly what Russia wants. There is a phenomenon in psychology called mirroring, where you fall into the habit of simply reflecting the behaviors of your opponent. And that is, for me, one of the risks for Ukraine. It’s a huge mistake for the Ukrainian government, for the Ukrainian people, to create a troll factory like St. Petersburg, churning out counter-propaganda in social media. It’s a huge mistake to create a “Ministry of Truth” that tries to generate alternative stories. That is not the way to defeat this information warfare. In fact, Ukraine doesn’t need more state-sponsored media. What Ukraine needs is a successful Ukraine. And I would argue – and I was glad to see Dmytro say very much the same – the single most powerful refutation to the Kremlin’s hybrid war and information campaign against this country is a successful, modernizing, European, democratic Ukraine. In that regard, nobody will be surprised to hear me say that the number one priority for Ukraine and Ukrainian society in 2016 needs to be prevailing in the war against corruption. It is the key issue in demonstrating that Ukraine is moving forward. In that regard, I would argue the best weapon against the Kiselyovs of the world is your anti-corruption prosecutor. It’s deputy prosecutors general like David Sakvarelidze, who are trying to hold criminals accountable. It’s your NABU. All of which are institutions that the United States will strongly support. When I think back on that terrible year of 2014, and the tidal wave of propaganda that came out of the Russian government, the single most important event, I think, in changing that narrative in the West, certainly in the United States, was your successful presidential election of May 2014 – an election that met the highest OSCE standards and in which the Ukrainian people turned out in large numbers to express their democratic choice. That was the best answer to the false allegations about Praviy Sektor and all the rest. And you can see how that’s the story that Russia has no good answer to. Ukraine needs to continue building a strong foundation of European democracy, just as you built on May 2014 presidential elections with successful Rada elections in October 2014, to demonstrate that Ukraine is moving forward. Continue to broaden and deepen your ties with the European Union. Make clear that there is no turning back. Make clear that you will live up to the highest standards of European governance. Continue to build your trade and investment ties with the West. Encourage Europeans to come here and see for themselves that what they see on Russia Today is a massive distortion of the reality. And continue the strong record that Ukraine’s government has demonstrated since December 2014 of pushing forward with the hard work of reform. I hear some very dangerous voices today saying that, “We’ve had enough of these technocratic ministers. We’ve had enough of professional governance. Now it’s the politicians’ turn to take the reins. That there should be a reload of the government to put real politicians, and not these technocratic English-speaking ministers we’ve had over the past year.” I think that would be an enormous mistake, in part because it would fuel the Kremlin attempt to mischaracterize Ukraine and say that Ukraine is a failing state, when in fact Ukraine is an emerging European democracy. A couple of last thoughts. The media space is obviously key to all of this. In this regard, it is important that Ukraine continues to develop professional, credible, and independent journalism free from oligarchic control. I know it’s a tiny piece of the media space, but I cannot say enough good things about Hromadske TV and what it represents as a model of objective, independent journalism – not answerable to any oligarchic or political agenda. I don’t think Ukraine needs more propaganda machine. What Ukraine needs is more objective information. Protect freedom of speech. It’s critically important, and a core European value, to allow diversity of opinions, even if those opinions are critical of the government, and even if one political faction or another may not agree with those opinions. And then, finally, for journalists to stick to professional standards. To report the facts. To overcome and reject efforts to buy their coverage. And not to fall into the trap, which I think sometimes happens in international media, of arguing or believing that the test of objectivity is to report both sides of an argument, even when one side is patently and transparently manufactured. These are the ingredients for Ukraine’s success. And what I want to underline today is my government’s commitment to continue, as we have for the past two years, to stand foursquare with the Ukrainian people, to work closely with the government and the presidency and the people of Ukraine to advance the European choice that you have made. And most importantly, to always side with those who are committed to reform, and to always side with those who believe that falling into the habits of the past is the single biggest trap that Ukraine faces looking to the future. I’m very confident that the reformers are going to prevail, and I’m absolutely confident that in this hybrid warfare with Russia, Ukraine is going to prevail – because you’ve overcome already the worst that the Kremlin can throw at you. So the job now is not to give up, and to continue moving forward. And the United States will stand with you in that effort. Publication of 02 1, 2016.